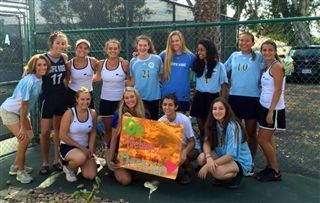 Last week, a group of Pacific Ridge Girls Basketball players elected to support their fellow Firebird athletes by attending a Girls Varsity Tennis match. Bolstered by the cheers of their peers, the tennis team defeated Santa Fe Christian 14-4. What a great example of Firebird spirit!